This article will show you how to install Flood. The software is a front-end for rTorrent and an alternative to ruTorrent. This section covers the Flood process - starting it, stopping it and restarting it. It also covers checking if the process is running, in case that becomes necessary. kill "$(pgrep -fu "$(whoami)" "apps/flood")"
kill -9 "$(pgrep -fu "$(whoami)" "apps/flood")"
This is what you should see after creating your account. At this point, refresh the page to be taken to the login screen. 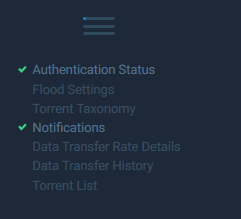 Log in using the details you just created and Flood should fully load, displaying your torrents.